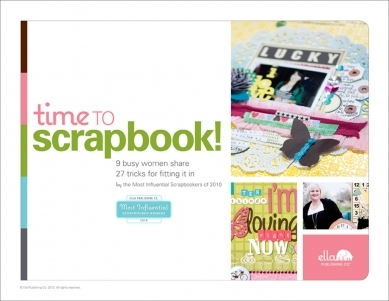 There was quite a bit of excitement and buildup this past month at Ella leading up to the announcement of The Most Influential Scrapbookers of 2010. This particular eBook focuses on the issue that so many of us have that love this wonderful (yet sometimes time-consuming) hobby...finding time for it! These nine ladies each share and discuss their top three tips for fitting scrapbooking into busy lifestyles. While some tips contradict each other (and this is recognized in the introduction), this only brings authenticity to the work as they are simply sharing what works for them. Personally, I found several tips that I consider my own tried and true strategies such as 'choose a few go-to designs' (Noell Hyman) and 'order photos in batches' (Shimelle Laine) and some that made me stop a think a bit...ones that I almost consider a challenge such as 'make 'I don't care' pages' (Stacy Julian). Each contributors three tips are also accompanied by a personal layout on the theme 'ten things I love about my life right now' for a great compilation of styles and techniques...further enforcing that there really is no 'right way' to share your memories and record what's important to you. 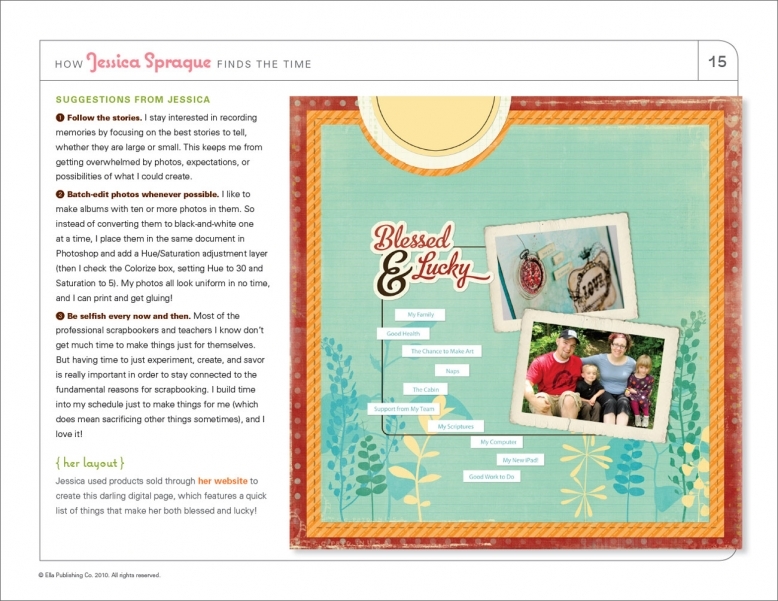 I have one free download of Time to Scrapbook! available for one lucky reader. Simply tell me YOUR top tip for fitting scrapbooking into your busy schedule by Thursday, August 12th, 2010 at 5 p.m. (CST) and you'll be entered for your chance!